This article is about Karl Marx's work. For the coup d'état itself, see French coup d'état of 1851. The Eighteenth Brumaire of Louis Napoleon (German: Der 18te Brumaire des Louis Napoleon) is an essay written by Karl Marx between December 1851 and March 1852, and originally published in 1852 in Die Revolution, a German monthly magazine published in New York City and established by Joseph Weydemeyer. Later English editions, such as an 1869 Hamburg edition, were entitled The Eighteenth Brumaire of Louis Bonaparte. The essay discusses the French coup of 1851 in which Louis-Napoléon Bonaparte assumed dictatorial powers. It shows Marx in his form as a social and political historian, treating actual historical events from the viewpoint of his materialist conception of history. The title refers to the Coup of 18 Brumaire in which Napoleon Bonaparte seized power in revolutionary France (9 November 1799, or 18 Brumaire Year VIII in the French Republican Calendar), in order to contrast it with the coup of 1851. 3 "History repeats ... first as tragedy, then as farce"
In the preface to the second edition of The Eighteenth Brumaire, Marx stated that the purpose of this essay was to "demonstrate how the class struggle in France created circumstances and relationships that made it possible for a grotesque mediocrity to play a hero's part." This essay contains the most famous formulation of Marx's view of the role of the individual in history, often translated to something like: "Men make their own history, but they do not make it as they please; they do not make it under self-selected circumstances, but under circumstances existing already, given and transmitted from the past." The Eighteenth Brumaire catalogs the mass of the bourgeoisie, which Marx says impounded the republic like its property, as composed of: the large landowners, the aristocrats of finance and big industrialists, the high dignitaries of the army, the university, the church, the bar, the academy, and the press. It also shows more criticism of the proletariat than is typical of his other works, referring to the bureaucracy as a "giant parasitic body" and describing widespread perceptions of the proletariat as a "party of anarchy, socialism, and communism," a party paradoxically established on precepts of an oppositional "party of order." Along with Marx's contemporary writings on English politics and The Civil War in France, the Eighteenth Brumaire is a principal source for understanding Marx's theory of the capitalist state. Marx's interpretation of Louis Bonaparte's rise and rule is of interest to later scholars studying the nature and meaning of fascism. Many Marxist scholars regard the coup as a forerunner of the phenomenon of 20th-century fascism. "History repeats ... first as tragedy, then as farce"
.... it really seems as though old Hegel, in the guise of the World Spirit, were directing history from the grave and, with the greatest conscientiousness, causing everything to be re-enacted twice over, once as grand tragedy and the second time as rotten farce, Caussidière for Danton, L. Blanc for Robespierre, Barthélemy for Saint-Just, Flocon for Carnot, and the moon-calf together with the first available dozen debt-encumbered lieutenants for the little corporal and his band of marshals. Thus the 18th Brumaire would already be upon us. ^ "The Eighteenth Brumaire of Louis Napoleon". Retrieved 2009-06-03. ^ Jon Elster, An Introduction to Karl Marx, Cambridge, England, 1990 (first pub. 1986), p 8. ^ Tucker, R.C. "The Marx-Engels Reader, 2nd ed.," page 594. New York: Norton, 1978. ^ "The Dreyfusian Revolution by George Sorel 1908". Retrieved 2009-06-03. ^ Karl Marx. The Eighteenth Brumaire of Louis Bonaparte. 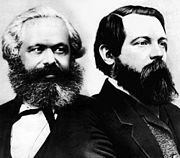 ^ Marx/Engels Collected Works. International Publishers. ^ Quoted in Francis Wheen (July 2001). Karl Marx: A Life. W. W. Norton & Company. ISBN 978-0-393-32157-9. Retrieved 8 March 2011. , pages 25-26. Wheen points out the similarity between this passage and the one in Eighteenth Brumaire, but his quotation of the latter is a different translation or version than the one which appears above, or is perhaps a garbled combination of the Marx and Engels passages. Margaret A. Rose, Reading the Young Marx and Engels: Poetry, Parody, and the Censor. London: Croon Helm, 1978. The Eighteenth Brumaire Of Louis Bonaparte, International Publishers, New York City, 1963. This page was last edited on 12 February 2019, at 21:07 (UTC).